Lutein and zeaxanthin are two important macular degeneration antioixdants. Find out why you need them and how measuring your macular pigment can help you. While the lutein is concentrated mostly in the rod cells of your retina, the cone cells, which are responsible for detailed central vision, have a high concentration of zeaxanthin. Usually you will see zeaxanthin and lutein together - that's because they are pigments both found in the macula. Both of these pigments are so prevalent in the macula they are called the macular pigment (MP). Zeaxanthin is actually pronounced like zee-ah-ZAN'-thin. So now that you now how to say it, let's look at why this carotinoid is important for you to know about, what are some good food sources and eye health vitamins that contain it. ZeaVision is a company in St. Louis, Missouri that not only holds US patents on Zeaxanthin but has also developed state-of-the-art testing devices to measure macular pigment levels. Their corporate values include what they call "Intelligent Macular Degeneration Risk Management." 1. Measure macular pigment level. 2. Manage with comprehensive risk assessment, nutritional counseling & supplementation. 3. Monitor and re-measure at 6 months. 4. Maintain healthy macular pigment level. A representative from ZeaVision answers some important questions for us. 1. Explain what macular pigment is and its role is in the development of macular degeneration. The macula is located in the back of your eye (in the retina) and is pigment comprising three carotenoids – Zeaxanthin, Lutein, and Meso-Zeaxanthin. Low Macular Pigment Optical Density (MPOD) is a key risk factor for Age-Related Macular Degeneration (AMD). Macular pigment plays an important role in protecting the cones in the back of the eye that are responsible for your central vision. The macula can “thin” over time due to age, but other factors like family history, and lifestyle choices may contribute to lower Macular Pigment Optical Density (MPOD). • Photophobia – sensitivity to light. • Contrast Sensitivity – the ability to distinguish an object from other objects or background with similar lighting. • Distance Viewing and Haze – vision improvement in an open area, the effect of haze on how far one can see. • Glare Disability and Veiling – Reduction in vision due to direct bright light or bright light at an angle. • Color Saturation – blue light spectrum tends to scatter in the eye causing a reduction of saturation of colors. • Chromatic Aberration – different wave lengths of light focus at different point in the eye causing a bluish purple outline to some objects. • Acuity - ability to see clearly is affected by contrast sensitivity, glare, and light scatter. 2. Tell us why it's important to have the macular pigment measured and how it is done. It is important to have your macular pigment measured because low macular pigment is a key risk factor for Age-Related Macular Degeneration (AMD). QuantifEye is a scientifically-proven instrument that measures Macular Pigment Optical Density (MPOD) using heterochromatic flicker photometry technology that provides accurate and reproducible results. MPOD scores are based on a scale from 0 to 1. An individual with an MPOD score below .45 may have greater risk of developing AMD, as scientific research supports low MPOD as a key AMD risk factor. Low MPOD is defined as 0 to .20 density units, mid-range is .21 to .44, and the higher range is above .45. The average MPOD score in the US is .35 and the prevalence of AMD is increasing significantly based on the aging population and unhealthy lifestyle choices including poor diet, smoking, and high body mass index, among others. 3. Why do you say that zeaxanthin could be the most critical eye nutrient? Zeaxanthin is a yellow-orange carotenoid - a pigment found in fruits and vegetables such as peppers, corn, and oranges. Think about how an apple’s skin keeps the inside from turning brown – a leaf on a tree or a pepper that grows in the hot sun – what protects them from withering and dying? Carotenoids. Well, Zeaxanthin is one of three carotenoids found in the macula, located in the retina in the back of your eye. Healthy macular pigment levels protect the cones in the macula in the back of the eye that are responsible for central vision. Scientific research demonstrates that the fovea (located in the center of the macula) contains a natural 2:1 ratio of Zeaxanthin to Lutein. As Zeaxanthin naturally accumulates at this ratio, it is important to maintain healthy macular pigment through diet and/or supplementation. 4. What foods are rich sources of Zeaxanthin? Green leafy vegetables, corn, orange peppers, eggs. 5. 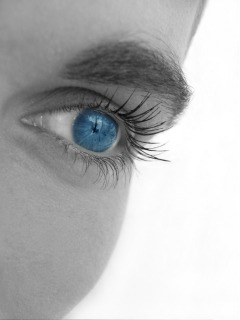 Can diet provide enough Zeaxanthin for good eye health? The average daily diet is scarce in Zeaxanthin with most diets falling 1-6 mg short of the amount of Zeaxanthin associated with reduced risk for Age-Related Macular Degeneration (AMD). While Lutein is more readily available through fruits and vegetables, one would have to eat 20 ears of corn to get the recommended amount of dietary Zeaxanthin to maintain healthy macular pigment levels. One EyePromise Restore softgel contains 8 mg of all natural, dietary Zeaxanthin. 6. Share some of the more critical research or studies that have been done on macular pigment,macular degeneration and Zeaxanthin. Journal of Optometry, November 2011, Richer, Stuart, et. al. –	Participants with genetic age related macular degeneration risk factors in the highest tertile of dietary zinc, β-carotene, lutein/Zeaxanthin, and EPA/DHA intake had a significant hazard ratio reduction for AMD of approximately 40%. –	Serum levels of carotenoids and retinol were significantly lower in cases with exudative AMD than in controls. –	No significant associations between serum lutein and cases with early or exudative AMD were observed. –	Higher dietary intake of Zeaxanthin and lutein reduced risk of age related macular degeneration (in 3654 patients) by 65%. –	Confirmed protective influence of zinc. –	Higher beta-carotene associated with increased risk of AMD. –	Participants reporting highest intake of Zeaxanthin & lutein less likely to have advanced AMD (NV & GA) or intermediate drusen. 7. Who should take Zeaxanthin supplements and how much is recommended for macular degeneration prevention and early macular degeneration? While one cannot prevent Age-Related Macular Degeneration, a proactive approach to AMD risk management includes maintaining healthy macular pigment levels. Patients with a Macular Pigment Optical Density (MPOD) score below .45 are recommended to take two EyePromise Restore softgels a day (totaling 16 mg of Zeaxanthin) until their MPOD score reaches .45 or higher. are encouraged to take 1-2 EyePromise Restore softgels to maintain healthy macular pigment levels. Most patients continue with a maintenance dose of 1-2 softgels per day after achieving a .45 score or higher. When patients cease supplementation, they will eventually return to their baseline MPOD score. 8. What should a person look for in a Zeaxanthin supplement? What makes EyePromise different from other macular degeneration vitamins? EyePromise eye vitamins contain patented levels of Zeaxanthin with the most dietary Zeaxanthin (derived from all natural paprika) of any product in the market. EyePromise Restore replicates the natural 2:1 ratio of Zeaxanthin to Lutein found in a healthy fovea, and each softgel contains 8 mg of all natural, dietary Zeaxanthin, along with other vitamins and nutrients including Omega-3s and Vitamin D3. EyePromise Zeaxanthin is perfect for vegans or those with fish allergies, and each Veggiecap contains 10 mg of all natural, dietary Zeaxanthin. EyePromise eye vitamins are all natural, made from the highest quality ingredients in the USA, and backed by a 60 day money-back guarantee. EyePromise Restore and Zeaxanthin are designed to be taken with a multi-vitamin.